I merged a few Fallout 4 music mods. Updated to version 20.3 (5/24/18). The four new faction tracks from Bleak Beauty have been added, and a restructure of the combat tracks has been implemented. Reuploaded both files to fix a mistake I made with BB (5/25/18). Updated DLC version to 20.2 (5/11/18). Supports NPS 2.1 (only DLC were modified, main file without DLC unaffected). Updated to version 20.1 (4/28/18). I decided that this update wasn't big enough to be version 21. Included Glowing Sea music from WotC. Updated to version 20 (4/6/18). Restructured -again- to support Faded Glory 3.5. Now includes the 3 public tracks from Immersive Fallout. Updated to version 19 (3/24/18). Now supports Faded Glory v3.0 and Immersive Fallout (only the music files). Updated to version 18 (3/18/18). ECM is now supported. (2/11/18) Reuploaded in a ZIIP format to hopefully fix any upload/download errors. Updated to version 17 (2/6/18). Now supports NPS 2.0 and Bleak Beauty non replacer. Updated to version 16 (10/30/17). Added the one new track from Musical Lore. Updated to version 15 (10/17/17). Added the non replacer version of S.T.A.L.K.E.R. music mod. That mod made implementing it much easier. Updated to version 13 (8/19/17). All tracks from Faded Glory re-added to match v2.0. DLC version now also requires Nuka World and Automatron. Updated to version 12 (8/18/17). Added all new tracks from Faded Glory v1.6. The mod is now DLC optional. Updated to version 11 (8/18/17). Added some new tracks from NPS 1.8. Renaming still needed. Also added Faded Glory. Now requires Far Harbor and Vault-Tec Workshop DLCs. Updated to version 10 (6/22/17). Added new tracks from NPS 1.7. Rename MUS_Combat_Finale_02.xwm to MUS_Combat_02_Finale.xwm. Updated to version 9 (6/16/17). Added tracks from Echoes. I couldn't find a track that used MUS_Combat_07(_finale).xwm so feel free to remove those two. Rename MUS-Combat_Boss_04.xwm to MUS_Combat_Boss_04.xwm. Updated to version 8 (5/25/17). Added new tracks from NPS 1.6. Rename MUS_Combat_Finale_02.xwm to MUS_Combat_02_Finale.xwm. Updated to version 7 (5/14/17). Added tracks from DV's Soundtrack, added 2 missed tracks from Bleak, and renamed all new tracks' EditorIDs to better keep track of them. Updated to version 6 (5/7/17). I'm an idiot; two files from NPS were added to the playlists. They are "MUS_Explore_Night_01.xwm" and "MUS_Explore_Night_02.xwm." Re-add them to the NPS folder if you deleted them. Added tracks from Bleak Beauty and fixed more DN users. Updated to version 5 (5/1/17). Added tracks from NPS and fixed some empty DN users. I've discovered that there's an extremely loud track included with NPS. If you wish to delete it or modify it yourself, it is "MUS_Explore_Foothills_Day_01.xwm". Updated to version 4 (4/28/17). Added tracks from DN Mega Battle pack. Updated to version 3 (2/4/17). Includes new tracks from DN 1.1. Updated to version 2 (1/22/17). Added Musical Lore. Download Digital Nightmare v1.10 Main from Digital Nightmare. Extract DN Music - Main.ba2 to your Data folder. Use Archive2 to extract the contents of the BA2 to your /Data folder. Endorse it 15 minutes later. While you're at it, download a main file from Digital Nightmare Re-Coded and endorse it since I based part of this mod on that. Note that this mod does not include the Far Harbor Music Update nor the two optional combat files. You can use those at your own discretion. Please note that the optional combat files might not work with this mod. You can check with FO4Edit. Download Classic Fallout Ambient Music v1.2 from Classic Fallout Ambient Music. 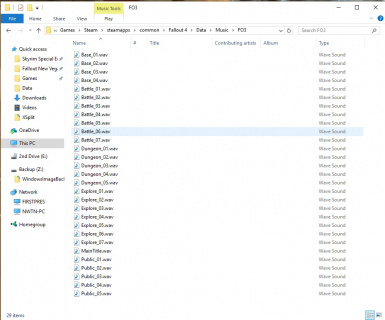 Extract the Music folder from that archive to the Data folder of your Fallout 4 installation. If you downloaded it with NMM, install either version then deactivate Classic Fallout Music.esp. Endorse it 15 minutes later. Download Fallout Suite v.1.1 from Fallout Suite. Extract Fallout Suite - Main.ba2 to your Data folder. Use Archive2 to extract the contents of the BA2 to your /Data folder. Endorse it 15 minutes later. 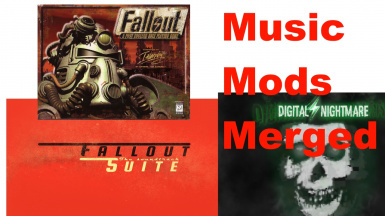 You need to make sure you have a copy of the Fallout 3 OST or the music files from Fallout 3. They can be found in the folders Base, Battle, Dungeon, Explore, Public and Special (for the MainTitle file), in the folder \Fallout 3 goty\Data\Music. You'll need to make sure the music files are converted to .wav files (there are countless ways to do this, I recommend you google it), and you'll need to make sure they are named properly (so that the mod can read them). You'll need to manually add the music files to the folder this mod adds, Steam\steamapps\common\Fallout 4\Data\Music\FO3. Go to Fallout 3 ambient music to download his/her mod to endorse it after 15 minutes, but don't install it. *The game will not crash with a misnamed file, but instead not play it. Download Musical Lore V1.2 from Musical Lore - Wasteland Edition. Extract the Music folder from that archive to the Data folder of your Fallout 4 installation. If you downloaded it with NMM, deactivate NirShor-MusicalLore.esp. Endorse it 15 minutes later. Download Mega Battle Pack from Digital Nightmare. Extract DNMega.BA2 to your Data folder. Use Archive2 to extract the contents of the BA2 to your /Data folder. There may be repeat tracks, however there are definitely new tracks added. Create a new folder in \Data\Music and name it DVCS. Download either the DV's custom Fallout 4 Sountrack 1.8 main file OR the DV's custom Fallout 4 Soundtrack - no geiger sound fix MANUALLY from DV's Custom Fallout 4 Soundtrack. Extract all files from the Music folder and the Death folder (do not extract the Palettes and Special folders) to your new DVCS folder. If you wish, you may also download the Combat Music Addon and extract all the files to your DVCS folder. The normal tracks (i.e. MUS_Dungeon_01.xwm) must be in \Data\Music\DVCS. The Death tracks must be in the Data\Music\DVCS\Death folder. Endorse the mod 15 minutes later. Create a new folder in \Data\Music and name it Echo. Download the main file from Echoes - A Fallout 4 Music Overhaul MANUALLY. Extract all files from the Music folder to your new Echo folder. I couldn't find a music track that used MUS_Combat_07(_finale).xwm so feel free to remove those. Also, rename MUS-Combat_Boss_04.xwm to MUS_Combat_Boss_04.xwm. Endorse the mod 15 minutes later. Download the Stalker Music 1.1 main file from STALKER Music Mod MANUALLY. Extract the music folder to your Data folder, do not extract the ESP file. If you downloaded it with NMM, deactivate StalkerMusic.esp. Endorse the mod 15 minutes later. Create a new folder in \Data\Music and name it ECM. Download either the Enhanced Combat Music - v4.0 Final main file OR the Enhanced Combat Music - Metal Edition v2.0 optional file from Enhanced Combat Music. It's up to you on which version you want from there. Extract the contents from the Music folder inside the archive to your new ECM folder. Endorse the mod 15 minutes later. Manually download either the main file OR the optional file from Faded Glory. If you installed Faded Glory before v3.0, delete the old folder or just delete all the tracks ending in .wav. Extract only the Faded Glory - Soundtrack Expansion - Main.ba2 file from the archive. Open the BA2 in Archive2. Extract all files somewhere. Move the extracted Music folder to \Data. The folder structure needs to be \Data\Music\Faded Glory - Soundtrack Expansion. Endorse the mod 15 minutes later. Create a new folder in \Data\Music named zana. MANUALLY download the main file from Immersive Fallout. Make your way through the archive (Immersive Fallout > files) and extract Immersive Fallout - Music - Main.ba2 somewhere. Extract the music tracks from that BA2 archive with Archive2. Move all tracks from its Music folder to your zana folder. You can delete the special folder. Endorse the mod 15 minutes later. Manually download the Glowing Sea Extended Legacy Assets optional file from War of the Commonwealth. Extract ONLY the GSSExplore tracks to your music folder. You'll only hear the new tracks in the Glowing Sea. Endorse the mod 15 minutes later. Create a new folder in \Data\Music and name it NPS. Download the main file Postapocalyptic Soundtrack Version 2.1 from Fallout 4 - New Postapocalyptic Soundtrack MANUALLY. Extract all files from the Music folder in that archive to your new NPS folder. There should be five folders inside your NPS folder now, as well as a multitude of XWM files. Important: For now, there are two music files in NPS\DLC04 that require attention. You must remove the " Project" part of the file name to have my mod recognize them. They are more than likely accidental files so only do so if you're fine with accidental files being played. Endorse the mod 15 minutes later. Download the optional file Bleak Beauty 1.1 - Package for Music Mods Merged from Bleak Beauty. Install its contents. Thank you OrganicView for streamlining the installation on this mod. Endorse the mod 15 minutes later. Download and install this mod. Activate MusicMerged.esp OR MusicMergedDLC.esp. DO NOT USE BOTH. I don't believe load order matters. Do the installation in reverse. Or just disable the ESP from this mod. Either works.